Competition Water: Venue to be announced via email to the registered participants. Registration opens on November 4th at 6:00pm precisely. Please contact Todd Oishi after that time by email to register: info@innovativeflyfisher.com . Registration for this competition is limited to 32 competitors (General Membership and Youth Team Members combined), and is based on a first-come/first-serve basis. 3 spots for this competition are automatically reserved for the members of the Youth Team, in the event that this competition fills up before they're able to register. The 3 spots that are reserved for the Youth Team Members are also being dealt with on a first-come/first-serve basis. Once the registration is full (and each of these competitions promises to be sold-out events), additional registrants will be placed on a waiting list and moved onto the list of participants in the event that there are any cancellations. The first 3 competitors on the waiting list will automatically qualify for a spot in the next competition if there were no cancellations. If one or more of the competitors on the waiting list are unable to attend the next competition, their spot(s) will automatically be given to the next person(s) on the waiting list. Members of the Youth Team will be placed on a seperate waiting list. The first 3 Youth Team members on this waiting list will automatically qualify for one of the 3 spots that have been reserved for Youth Team Members at the next competition. In the event that any of the Youth Team Members on the waiting list are unable to attend the next competition, their spot(s) will automatically be given to the next Youth Team Member(s) on the waiting list. 1. One River Venue with 8 beats. 2. There are three sessions, which are 2 hours in length. 3. Maximum of 32 competitors. 4. Beats will be divided in half with 2 competitors assigned to each half of the beat (4 competitors in each of the 6 beats). 5. One competitor fishes at a time in each half of the beat, while the other competitor serves as their controller (time keeper, measuring fish, and recording eligible fish). 6. Competitor and controller switch roles at 15 minute intervals for the duration of the session. 7. Competitors rotate half beats after one hour and switch the order in which they fish and control. 8. Competitors rotate partners within their group after each session. 9. 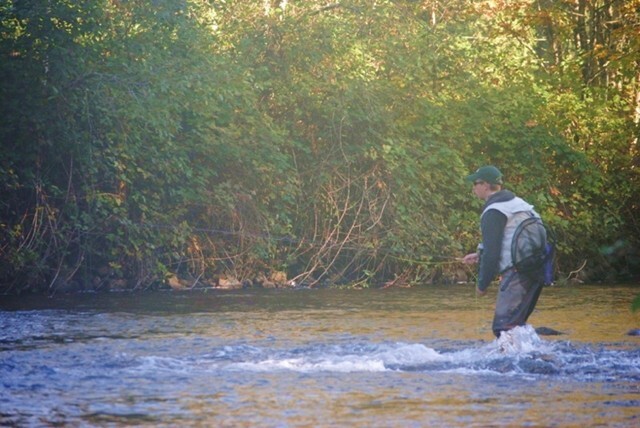 Competitor rotation assures that everyone will fish with a different partner during each session. 10. Eligible fish species: Rainbow Trout, Cutthroat Trout, Bull Trout, Dolly Varden, White Fish, and Northern Pike Minnow (salmon are not an eligible species and are to be avoided). 14. 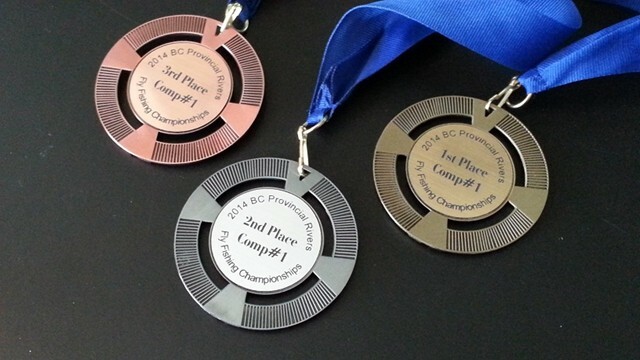 Fly Fishing Canada Rules apply to this competition (single barbless hooks, no strike indicators or splitshot). * This point system will ensure that all fish are quickly measured and released, with absolutely no need to handle them or remove them from the water. ** The organizer will provide rulers that will be attached with zap straps to the bottom of each competitor's net. 7:00am - Competitors' Meeting at Designated Location (details sent in private email to all competitors). 7:30am - Carpooling and departure for the river and their competition beats. Competitor 1 and 4 are paired on lower beat half - Competitor 2 and 3 are paired on upper beat half. Competitor 1 and 3 are paired on lower beat half - Competitor 2 and 4 are paired on upper beat half. Competitor 1 and 2 are paired lower beat half - Competitor 3 and 4 are paired on upper beat half. A single coin toss will be performed during the draw in order to determine the order for fishing. 4:15pm: Competitors' Meeting, final results, awards, and socializing in the designated parking lot. * Results and updates will be posted within 24 hours of the completion of this competition. 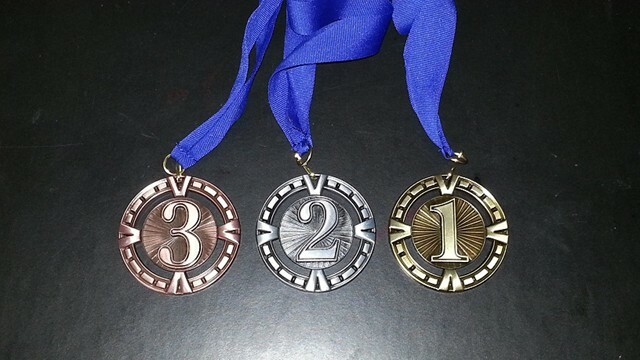 A set of Individual Medals (Gold; Silver; and Bronze) will be a awarded to the Top 3 Competitors at the conclusion of each and every competition of this championship. Due to the overwhelming response, and the recent addition of several new competitors to the West Coast Rivers Winter League, I've added 2 more gorgeous stretches of water/beats for this competition, which means that we can now increase the registration to accommodate 32 competitors! This also means that the majority of the league members will now be able to participate at this event and/or will be guaranteed a spot at the next competition. At this point we have 43 registered league members that are active competitors and members of the following 12 teams: Team USA; Team Cormorant; Team Mustang; Team Endiable; Team Mötley Crew; Team Airflo; Team Tight Lines; Team Dredge Hogs; Team MRFD; Team King Fishers; Team Hungary; and the Canadian Youth Team. Who would thought that we would have had such a great response and so much interest in this year's rivers championship! Thanks again for the outstanding support and overwhelming interest in these events! Your participation will not only help you to grow and improve your skills as competitors, but will help to inspire and provide some very on-the-water training and coaching for the members of our Youth Team! Registration for this competition is limited to a maximum of 32 competitors (General Membership and Youth Team Members combined), and is based on a first-come/first-serve basis. 3 spots for this competition are automatically reserved for the members of the Youth Team, in the event that this competition fills up before they're able to register. The 3 spots that are reserved for the Youth Team Members are also being dealt with on a first-come/first-serve basis. If someone says you fish too much, stop talking to them. You don't need that kind of negativity in your life. Emailed exactly at 6 pm. sent asap, looking forward to it! Email sent, Devin and Rob. e-mail sent at 6:00 pm exactly. Sent my email at 6 as well. Looking forward to it! Hope I am not to late. Sent my email right at 6 as well.